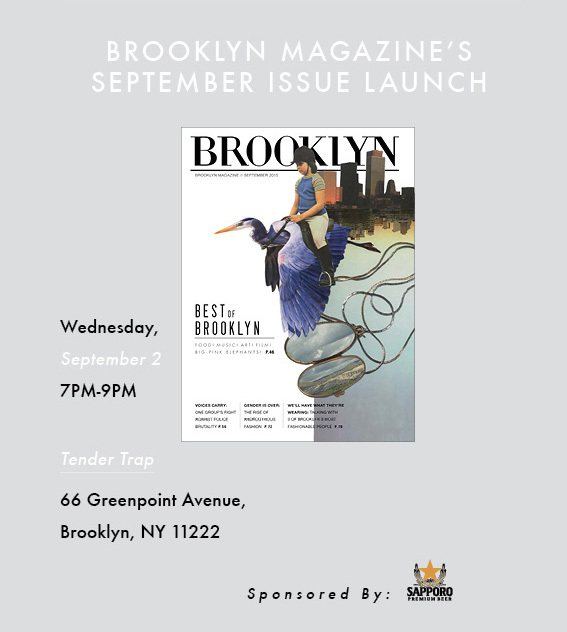 You’re invited to celebrate Brooklyn Magazine‘s September Issue Launch this Wednesday, September 2nd from 7-9 PM! We’re taking over Tender Trap to celebrate our transition from a quarterly publication to your new favorite monthly magazine. Enjoy a bar stocked with by Sapporo Premium Beer, hot-off-the-presses copies of the magazine, and some great tunes DJ’ed by Charly Bliss. Tags: Brooklyn Magazine, Free NYC, NYC events, Open Bar. Bookmark the permalink.